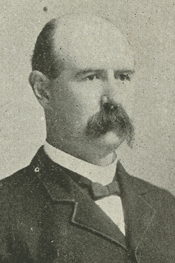 HALL, Uriel Sebree, (son of William Augustus Hall and nephew of Willard Preble Hall), a Representative from Missouri; born near Huntsville, Randolph County, Mo., April 12, 1852; was tutored privately and was graduated from Mount Pleasant College, Huntsville, Mo., in 1873; served as superintendent of schools at Moberly, Mo. ; founded an academy at Prairie Hill, Mo., and served as its president; studied law; was admitted to the bar in 1879 and practiced in Moberly, Randolph County, Mo., until 1885, when he engaged in agricultural pursuits near Hubbard, Mo. ; elected as a Democrat to the Fifty-third and Fifty-fourth Congresses (March 4, 1893-March 3, 1897); declined to be a candidate for renomination in 1896; president of Pritchett College, Glasgow, Mo., 1897-1901; moved to Columbia, Mo., in 1918 and founded the Hall West Point-Annapolis Coaching School, serving as its president and supervisor from 1918 to 1930, when he retired; died in Columbia, Mo., December 30, 1932; interment in Oakland Cemetery, Moberly, Mo.